It was then that the most surprising thing happened! “A man, whom I had never met before, took my hand very gently and walked me through the crowds. I didn’t feel as though we were pushing; it was as if the space opened up and we walked gently through. He took me to the altar steps and placed me right in front of the priest who was about to start the Mass. Then he suddenly disappeared. “I was a cradle Catholic. I went to Mass every Sunday, but only out of habit. 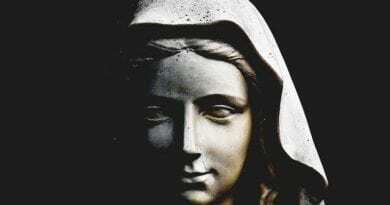 My husband was not a Catholic – in fact he was a Hindu, but we both decided that we wanted to bring our three children up as Catholics, that is, I always took them to Mass on Sundays and sent them to Catholic schools, etc. I thought that this was all I was obliged to do. I never prayed with them or taught them about God! The reality was that I was practicing my faith superficially, not living it with my heart. In addition to this, a Christian man told me that Jesus is not present in the host, and that to believe in the real presence was ridiculous, so I ended up doubting. During Mass I was thinking of everything but God and was looking forward to the end because I was bored. 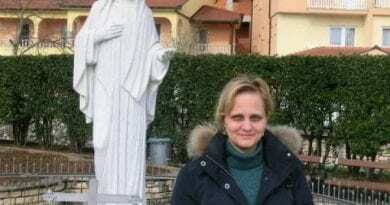 “I have a very good friend who had often been to Medjugorje. She kept pleading with me, ‘Come with me to Medjugorje!’ Finally despite great protest in my heart, I said yes. We were a group of six friends. As far as I was concerned, I was going for a girly week in the sun, to enjoy nature, and lots of chatting amongst friends. I didn’t think prayer would be on my agenda. It was May 1997. “The first days went as planned. I enjoyed the food, fresh air, sunshine and even going to daily Mass. I thought, ‘This is good!’ On the third day we went off with John, our Irish guide, in an old ratty van to a Mass being celebrated by Fr. Jozo at Siroki-Brijeg, where 30 Franciscan priests were martyred during World War II. It was a huge church that filled up quickly as I remained outside in the sunshine, chatting with friends. Mass was about to begin and the church was packed. All the benches were full and the isles so crowded that it was impossible to move. It was then that the most surprising thing happened! “A man, whom I had never met before, took my hand very gently and walked me through the crowds. I didn’t feel as though we were pushing; it was as if the space opened up and we walked gently through. He took me to the altar steps and placed me right in front of the priest who was about to start the Mass. Then he suddenly disappeared. I had the best spot there! I had a most surreal but calm feeling, as though it was all normal. 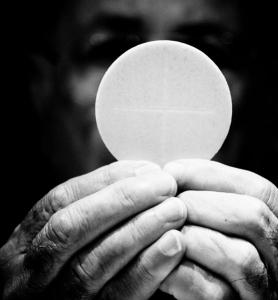 “I remember nothing of the Mass until the priest elevated the Host at the Consecration. The Host became huge to my eyes and Christ our Lord appeared alive in the Host. He was looking up. From that moment on, my whole life changed. I probably never stopped crying for the time I remained in Medjugorje. “When I returned home, I got into the habit of going to daily Mass. I drew all my strength and my joy from there. Jesus became my essential food. My Hindu husband listened respectfully to my testimony, and in spite of the great change which had taken place in me, he did not seem shaken. Moreover, I have never tried to convince him to share my faith, and equally he has allowed me to practice my faith freely. I prayed a lot for him. Several years later, as I was getting ready to go to Mass one day, he simply said to me, ‘I am coming with you!’To make a long story short, he is now a baptized Catholic and we are united in the same faith. Let me add that seeing the joy that radiates from Janet told me more about Jesus than her conversion story! ← Friday 5th January 2018 Today’s Holy Gospel of Jesus Christ according to Saint John 1:43-51. The Queen of Peace asks us to recite these two simple prayers every evening. 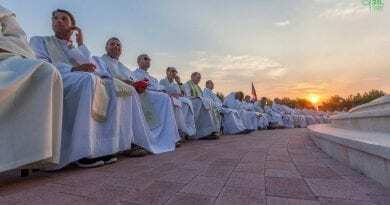 Medjugorje: The Queen of Peace gives her a sign on Apparition Hill – Three Shooting Stars – “Then from the first moment that our souls came to know each other they loved each other “. 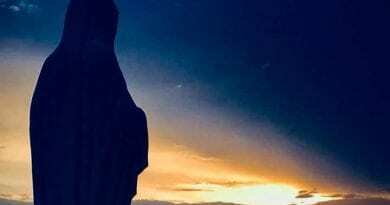 January 7, 2019 ryanmysticpost Comments Off on Medjugorje: The Queen of Peace gives her a sign on Apparition Hill – Three Shooting Stars – “Then from the first moment that our souls came to know each other they loved each other “.